Resumo: No âmbito de um Mestrado em Educação Pré-Escolar, foi lançado um desafio relativo ao uso de Software Livre com crianças em contextos educativos. Duas educadoras de infância experientes exploraram o MyPaint com uma mesa de desenho digital com os seus grupos. Durante a experiência, foram recolhidos dados sobre a forma como as crianças se apropriaram do uso do software e sobre dimensões da sua aprendizagem do e com o software. Através de uma análise de conteúdo, diferentes aspetos da experiência foram agrupados em temas: organização da exploração do software nos dois contextos; aprendizagem das crianças sobre desenho e materiais de desenho, com relações entre o uso do software o desenho tradicional; e a colaboração para a aprendizagem. A discussão destaca as dimensões da Pedagogia da Educação de Infância mais relevantes na experiência. Abstract: In a Master's Degree in Early Childhood Education, a challenge about using Free Software applications with children in educational contexts was proposed to the students. Two experienced teachers explored MyPaint with a graphics tablet with their groups of children. During the period of experimentation, data on the appropriation of the software by the children and on important dimensions of their learning of/with the software were collected. Through content analysis, different aspects of the experiences were clustered into themes: organization of the exploration of the software in both settings; children's learning about drawing, with relationships between the software use and traditional drawing; and the collaboration for learning. The discussion highlights the dimensions of Pedagogy of Early Childhood Education that were more relevant in this experience. In a recent edition of the Master’s Degree (MA) in Early Childhood Education (ECE) in the Higher School of Viseu (Polytechnic Institute of Viseu), special attention was given to Information and Communication Technologies (ICT) as a teaching and learning tool. The 16 students were already teachers, with more than 20 years of professional experience with children from 3 to 6 years old. Enrollment in the Master’s Degree was undertook as a professional development opportunity based on reflection about practices and conceptions, and engagement in quality improvement. In one of the courses of the MA programme, “Educational Technology”, a specific challenge was presented. The students were invited to discuss free/libre software in schools by using the softwares with children. We were looking for the experienced teachers’ views, but also the children’s views about the tools. Each teacher was asked to choose a software and some input device (mouse, whiteboard, graphics tablet) and conceive learning experiences relevant for their group of children. Teachers were also asked to gather evidence from their approach to the use of software in the classroom, the processes and outcomes obtained. A small written report was submitted by each teacher. Afterwards, the work was discussed with the whole class and two teachers from the MA: one from the Information and Communication Technologies department and one from the Early Childhood Education department, both involved in the OpenLab ESEV Project (http://openlab.esev.ipv.pt/). Two reports were selected for a deeper analysis. The material gathered by the the two teachers coauthoring this paper was used as data. Both had used photography to register children using the software and the input devices, gathered drawings made by the children – in the computer and traditionally – and took several field notes that included children’s reactions, sentences and interactions, as well as adult’s impressions and observations. Permissions from the children were collected and anonymity preserved. The paper presents those two experiences, developed in two different Early Childhood Education centers. In both cases, the free software MyPaint was used together with a graphics tablet. Three themes emerged from the exploratory analysis: a) the specific pedagogy of introducing software and input devices in each classroom and how it relates to the overall Pedagogy of Early Childhood Education constructed by the teachers, b) how children cooperate inside the pedagogical structure implemented by the teacher and how that cooperation relates to learning in early childhood education, and c) ways in which using software contributes to children’s drawing processes. After the identification of these three themes, a more detailed content analysis was developed, reconstructing narratives that allow for understanding of pedagogy and children’s learning in the experiences. Our background for using Information and Communication Technologies in Early Childhood Education is based on Papert’s perspective of children driving the technology (1996) in self-directed and socially relevant ways (Amante, 2007), as mind tools (Jonassen, 2006). The view of children as sharing a “participatory culture” (Jenkins, 2006), as the new thespians of a “collective intelligence” (Levy, 1997), requires from Early Childhood Education critical decisions regarding software. In the conception of such critical perspectives, the children’s experience and voice is regarded as essential (Oliveira-Formosinho, 2008; Sarmento, 2008; Soares, 2006). MyPaint (http://mypaint.intilinux.com/) is a Free/Libre Software graphics application for digital painting (Video 1). The software provides a simple and clean interface and was designed for pressure sensitive graphics tablets, although you can use it with a mouse. It also features a large collection of brushes that emulate real media (ink, charcoal, etc.) and a highly configurable system of options that allows modification and creation of brushes. MyPaint is available for Windows, GNU/Linux and Mac operating systems. Like other graphics applications, it is a digital art tool which can be used by children and in educational contexts with educational purposes (Gonçalves, 2006; Reis et al., 2008). Free Software isn’t software that you get for free or “gratis”. There are many softwares you can download or get for free that don’t qualify as Free Software. There is also Free Software being sold and bought. To better understand the concept, you should neglect the price and think about Free Software as computer programs distributed under a license that grants the user the freedom to run, copy, distribute, study, change and improve the software. As a way to avoid the ambiguity of the English word “free”, some people prefer the term Free/Libre Software. - Freedom 0: The freedom to run the program, for any purpose. - Freedom 1: The freedom to study how the program works, and change it so it does your computing as you wish. Access to the source code is a precondition for this. - Freedom 2: The freedom to redistribute copies so you can help your neighbor. - Freedom 3: The freedom to distribute copies of your modified versions to others. By doing this you can give the whole community a chance to benefit from your changes. Access to the source code is a precondition for this. There are several arguments for using Free/Libre Software and many of them are critical for educational settings. For the Free Software Foundation (2012), the main reasons are: a) “Schools should teach the value of sharing by setting an example”, b) social responsibility (“Educational institutions should not allow proprietary software companies to impose their power on the rest of society and its future”), c) “the school itself gains independence from any commercial interests and it avoids vendor lock-in”, d) “students are free to study how the programs work and to learn how to adapt them for their own needs”, and e) financial savings and the overall quality of several already available Free/Libre Software solutions for education. To us, as citizens but also as educators, as teachers and researchers, the ethical grounds are particularly important (Gonçalves & Figueiredo, 2014). We see using Free/Libre Software as a statement about the world we live in and how we choose to live in it. Video 1: MyPaint interface and photographs and productions from the children during the experience. IIn Portugal, Early Childhood Education for children from 3 to 6 years old is part of the educational system – it’s considered the first stage of basic education (Ministério da Educação, 1997). Although not mandatory, from age 3 years, children have a right to the educational component of the “jardim de infância” programme. In 2012, 89,3% of Portuguese children were enrolled in an Early Childhood Education center (FFMSa, 2013). The teachers have a Higher Education degree – four to five years masters degree since 2007. The Ministry of Education introduced Curriculum Guidelines in 1997 to improve the pedagogical practices and make the work with the children more visible (Ministério da Educação, 1997). The guidelines recognize the importance of quality Early Childhood settings for children’s early development and learning, allowing for local expression in different parts of the country (OECD Directorate for Education, 2006). There are around 4000 public, state “jardins de infância”, or Early Childhood Education centers, and 2400 ran by private, cooperative and charitable institutions (FFMS, 2013b). The state centers are administratively part of the educational groups of schools that aggregate schools, some from Early Childhood Education to Secondary school.The two settings were located in public, state schools, that offered Early Childhood Education and Primary Education. A common arrangement in Portuguese schools. A short description of each setting is presented. Setting A was in an urban school with four Early Childhood Education classes and 15 Primary Education classes (+/-420 children total). The female teacher worked with a group of 21 children, together with one female assistant. The classroom was organized in interest areas and there was one computer in the room (old equipment, with constant problems). The computer was used in the free choice activities by the children, autonomously. Children enjoyed large group discussions and making sense of what surrounded them. Learning regarding social and personal development was highly valued both by the teacher and the children. Conflicts and problems were discussed by everyone in the large group discussions. Drawing was strongly invested has a form of representation of children’s knowledge and sense making. Setting B was in an urban school with two Early Childhood Education classes and four Primary Education classes (+/-125 children total). The female teacher worked with a group of 20 children, ages 3-6 years old, with one female assistant. The classroom was also organized in interest areas. There was one computer in the room (described as old and slow) that was used in free choice activities by the children, autonomously. Drawing was one of the children’s favorite activities. They liked to use the computer to find information on the Internet and listen to music while watching the videos. The PC was also the “window” into their own life when the photos taken during the activities were shown. Conflicts arised when many wanted to use the computer at the same time. There was a whiteboard in a small room adjacent to the classroom. Children also used it in an autonomous way with background support from one of the adults. In both settings, drawing was valued by the teacher and the children, and there was a single computer in the classroom which was available for the children as an activity during free choice time. During free choice activities, the adults placed themselves in the background, observing all the activities, not specifically the computer use, and available to help. For the introduction of the MyPaint experience, in both contexts, the approach was similar. In a large group meeting, the adult introduced the new software by showing its interface and some features (the work space, different brushes and colors). The graphics tablet was also shown and shortly demonstrated. The main focus was on the idea that this was something which was now in the classroom and children could use. Both groups negotiated access to the computer and the graphics tablet by using the already existing structure: a) use it in the free choice activities time, b) two children at a time (already settled for computer use) (Figure 1), c) review of safety rules when using the computer. Both teachers highlighted the group interaction as something which they wanted to promote from the outset. The teachers also intentionally introduced the collaborative use of the computer and the learning of the software through its use. Working in pairs or in small groups is highly valued in the Portuguese curriculum guidelines (Ministério da Educação, 1997). Working with the computer is a situation that has been studied as promoting collaboration between children (Amante, 2004; Crook, 1998). Both teachers also strongly valued children’s autonomy in both setting the rules and organizing the groups and the time management for the first exploration. This is also connected to the curricular framework for Early Childhood Education in Portugal and in line with pedagogical practices studied in Portuguese settings (Folque, 2012). In setting A, a very lively and diverse use of the software ensued. The emphasis placed by the teacher in children’s authorship of the learning and the daily life in the classroom was visible. Groups of two to three children spent large amounts of time drawing, testing brushes and colors. The sharing of discoveries (not every feature of the software was disclosed by the adult) was made with enthusiasm. Small gatherings around the computer indicated something new was tried by someone and there was an opportunity for learning. This process of learning from each other was promoted by the teacher, suggesting that doubts were cleared with children who knew the solution, instead of by adult intervention. The teacher also organized large group discussions for sharing final drawings and descriptions of processes developed (“how did you do it?”). This was a time of rich learning: children asked many questions and shared both successful risks and difficulties or mistakes. What each had done was put together for and by the group. In setting B, children followed what had been agreed, exploring the software and the graphics tablet in pairs. This was agreed to allow more time for each child to use the new input device. The difficulties felt – what to do next, where to find a specific brush, how to change color – usually led to a request for adult support. The teacher decided to have a small working time with each group of children to assist in the beginning and then promote more autonomous use. The children changed pairs in the following days and kept their creations flowing. Soon, some children were more capable of using the software and knew more features of it, through autonomous exploration. Some requests for help between children happened and the sharing and support was enough for the adult support to become unnecessary. Still, successes were mostly celebrated with the teacher. She was called to see and acknowledge the pieces and to validate new features of the software when they were discovered. The communication to the large group was centered in the presentation of the drawings for celebrating the accomplishments. In both settings, children struggled with the graphics tablet. Having to look at the screen instead of the hand to accompany the result of the drawing movements was a very big challenge for both groups. “In the beginning, our eyes were always going to the pen, but not anymore!”, one of the child claimed with a sense of achievement. The needed pressure on the tablet also needed practice and experimentation. Both groups, after gaining enough proficiency with the tablet expressed preference for the pen instead of the mouse (Figure 2). In setting B, that was visible by observing that children were using the pen/tablet for playing educational games, which was previously made with the mouse. In setting A, children voiced their learning: “It was hard to press the pen until it went ahahaha… but not anymore. Now it’s easy. Now I’m more accustomed to the pen, more than to the mouse”. Children always faced the difficulties as something they could conquer, not giving up. The possibility of erasing and of reverting what was made was immensely explored by the children, like in the study by Gonçalves (2006). In setting B, the teacher reported how children were interested by the fact they could erase what had been done and do it again or change the way it was done. The possibility of controlling this processes was more significant than the final result. The overlapping layers of colors or brushes was also highly invested and experimented with. A lot of time and attention was devoted to brushes like grass, fur, leaves, dna, particles, beam-light or glow, which were discovered by the children through exploration. In setting A, the discovery of each brush was welcomed and celebrated and different uses were attempted. Children already drew clouds in their works (Figure 3). The finding of the cloud brush was described has “Fun, fun, fun! Real clouds!”. This enthusiasm was reflected in the extensive use of clouds in the MyPaint works (Figure 4). It also promoted changes in the traditional drawings: clouds were now represented by replicating what was first done in the software (Figure 5). 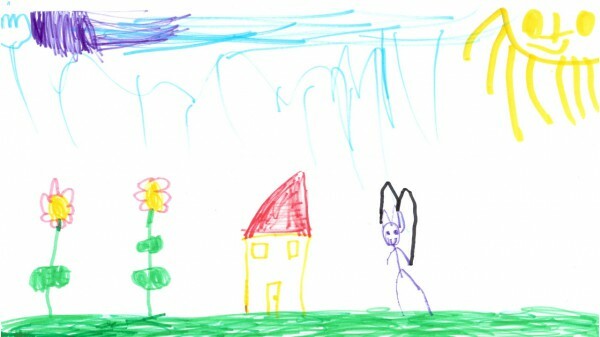 Children’s drawing as a form of expression has been largely studied (Soundy, 2012) and recognized (Malaguzzi, 2001). 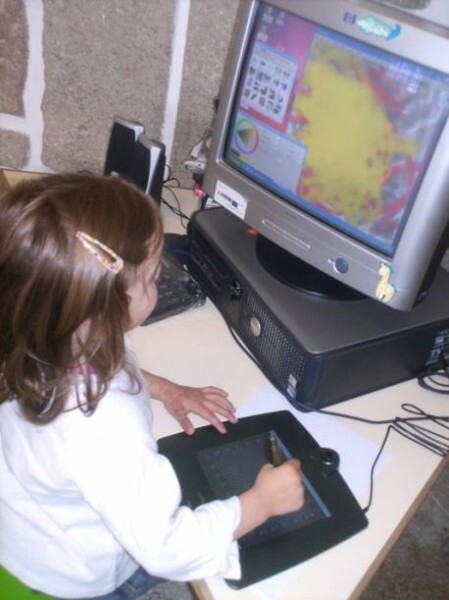 The experience of drawing in the computer was not a technical procedure for children – instead, purpose and emotions were driving the efforts. 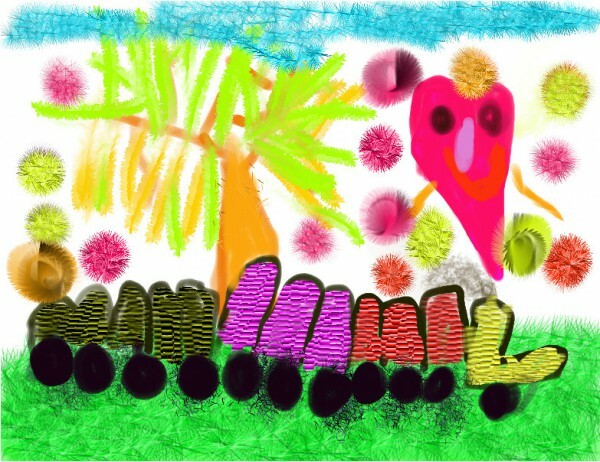 A train with sweaters (Figure 6) was accomplished by playing with the brushes. It was a playful endeavor, which brought joy and a sense of accomplishment for the child by allowing the unusual combination of a train and the texture of a woolen sweater. The elements presented by the software were recombined to create something from the child’s imagination and experience. 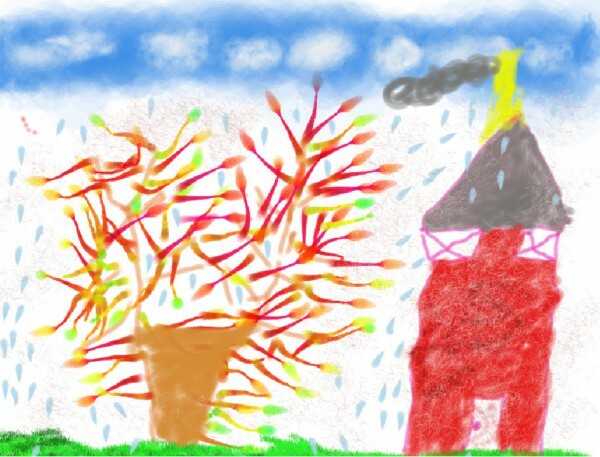 Another example of a contribution from the software to the creative processes, and children’s knowledge about drawing, has to do with MyPaint using the pressure sensitivity of the tablet in order to create a series of effects, allowing for smudging and blurring, when combined with the right brushes. Different brushes also allow for painting with different lines like airbrush or charcoal. When drawing in paper, a small group of children in setting A started to explore the pens and the pencils with which they usually drew, trying to achieve similar effects. Hence the title of the paper, expressing a question posed: “How do I blur the pencil?”. Children found solutions for this like tilting the pencils for a larger smudged line. Such attention to the traditional materials of drawing brought new learning for the children and opened new expressive potentials of the pens and pencils. In both settings, there was only one computer. No extra equipments were allocated to the experience. The graphics tablets were bought by the schools and only one was bought for each setting. This meant children had to share and wait for their turn to use something new and appealing. Both teachers had expressed some concern regarding possible problems. In setting B, conflicts about time in the computer were fairly common before the experience. During the experience, children showed patience in waiting for their turn. It was also registered that children observed, without interfering, what others did in their time. The sense that there were many features to discover maintained everyone’s interest, not only in the program but in its use by others. On the other hand, when the older or more fluent children tried to impose their knowledge to others, it did not lead to conflict as frequently as it did. Children seem to understood early on that being able to ask for help to colleagues was a good way to solve problems. “I didn’t know how to do it… where the delete was… but then Raquel found out and she told us, wasn’t it? It was cool!” (Figure 7). Studies grounded in a Vygotskian framework have supported the view that cognitive development depends on active, social interaction, including reasoning and explanation, with a more competent partner who has a different subjective understanding of the task (Fawcett & Garton, 2005). The vygotskyan emphasis on the social origins of mental functioning (Vygostky, 1978) are easily related to these observations that describe the learning happening in the social context. The core for the collaborative effort (Crook, 1998), knowing how to use the software and discovering new things about it, was implicitly shared by the children. It can be interpreted as supporting interactions directed at “co-construction”, meaning talking and acting in ways that reveal problem-solvers’ concern for coming to “have things in common” (Crook, 1998). The open nature of the tasks was important. In the educational games children played there was a right answer. In those tasks, help usually meant giving the right answer. But showing how to zoom in or out (one of the discoveries) didn’t replace the child in her creative process. Sharing a new found brush only feeds creativity, doesn’t close any process. Presenting the software in a way open to exploration and discovery (Bonawitz et al., 2011) was crucial for this collaborative process since everyone had something to learn but also to teach. This supported the more competent children (or ‘expert’ partners) to adjust the level of support or guidance required (scaffolding) to fit the ‘novice’s’ zone of proximal development, facilitating the inter-subjectivity interactions (Vygostky, 1978). Also important for collaboration was the sense of community that emerged within the overlapping experiences of solving the problems. The large group sharing of drawings and accomplishments in using the software, valued by both teachers, was important for this. The large group interactions and communications allowed for knowledge flow and sharing of learning by the collective but it also helped establish mutuality. The group was having a set of experiences or understandings in common and this was explicitly acknowledged and valued. This dimension of collaboration, a sharp sense of jointly owning a common and distinctive set of experiences (Crook, 1998), is an important one. It is also something familiar in quality Early Childhood Education settings (Portugal & Laevers, 2010). Based on the framework and the results of the study, we would like to finish with three reflections and connected challenges. The first focus of the paper was on Pedagogy of Early Childhood Education. The study strengthened the dimensions proposed by Siraj-Blatchford (2010), in line with the Portuguese curricular guidelines (Ministério da Educação, 1997): a) learning environment or “backstage” (physical space and resources, time, groupings, social interactions and relationships), b) tasks or activities presented and directed by the teacher (instruction), and c) interactions between adult and child focusing the child’s activity, during play, for example. The learning environment was important in creating the conditions for children’s explorations and learning by providing security and time in terms of access to the computer and opportunities for sharing discoveries and accomplishments. Collaboration was promoted by creating a secure environment where everyone knew their turn would come and where interactions about sharing and helping were promoted. These actions by the teacher are considered part of the Pedagogy of Early Childhood Education precisely as part of the “backstage”. The descriptions in the paper highlight their importance and detail the decisions by the teachers, with the children. Including children in the decisions is also part of the teachers’ pedagogy. The data collection didn’t allow to have detail about the adult’s interventions during the use of the computer and the large group meetings. But the teachers role in the large group meetings was highlighted. Those moments were used to to incorporate individual experiences in the collective experience. This is also part of the ECE Pedagogy: the adult intervention is needed to articulate the different dimensions as to intentionally initiate or maintain learning processes (Siraj-Blatchford, Sylva, Muttock, Gilden, & Bell, 2002). It is widely acknowledged that children’s experiences when playing and learning with technologies can contribute to their learning, particularly when they are supported by adults who monitor and support activities, provide encouragement and praise for achievements, and assist children in managing their emotions (Plowman & McPake, 2013). Research about media and technologies in Early Childhood Education has stressed the importance of considering the ways in which children learn from other kinds of experiences and activities that they encounter in their early years, supporting the case for playful, positive experiences, with social meaning (Amante, 2004, 2007; Figueiredo, Gonçalves, Ferreira, Henriques, & Semedo, 2007; Folque, 2011; Howard, Miles, & Rees-Davies, 2012). Introducing MyPaint and the graphics tablet was purposefully structured as a free choice activity for children. In the settings, computer use was already something children felt some control over and was presented as an open ended activity. The availability of other technologies in the same way is an interesting challenge for ECE Pedagogy studies. A second focus of the paper was on how children cooperate inside the pedagogical structure implemented by the teacher and how that cooperation relates to learning in Early Childhood Education. 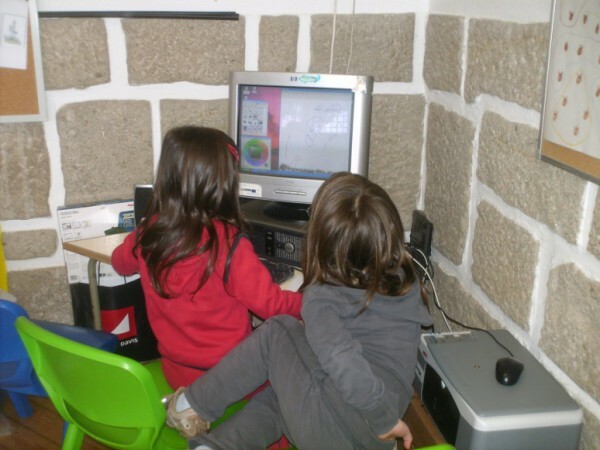 Collaboration surrounding technology use has been identified in studies about ICT in Early Childhood Education in Portugal (Amante, 2004; Faria, 2008; Piecka & Figueiredo, 2009; Reis et al., 2008). This experience contributed to that set of data that, alongside international studies, helps to assert technology as promoting social interactions and inter-subjectivity. The analysis of the specific types of interaction, as developed by Amante (2004), during the use of digital art tools is a second relevant challenge. 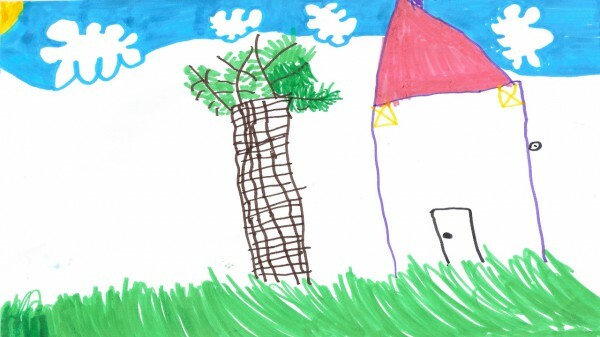 The third focus of the paper, ways in which using software contributes to children’s drawing processes, was analyzed using the available data, which had limitations. Although the children’s drawing and words were relevant to this account of the experience, their perspective on the software, the computer, the interactions, the learning and the role of the adults and their peers, were not the focus of the study. A third pedagogical and research challenge is to give more attention to children’s voice and deepen their participation in their educational experiences. Amante, L. (2004). Interação social e utilização do computador no pré-escolar. Revista Portuguesa de Pedagogia, 38(1, 2, 3), 425–450. Amante, L. (2007). As TIC na Escola e no Jardim de Infância: motivos e factores para a sua integração. Sísifo – Revista de Ciências de Educação, 3, 51–64. Bonawitz, E., Shafto, P., Gweon, H., Goodman, N. D., Spelke, E., & Schulz, L. (2011). The double-edged sword of pedagogy: instruction limits spontaneous exploration and discovery. Cognition, 120, 322–330. Crook, C. (1998). Children as computer users: the case for collaborative learning. Computers and Education, 30(3/4), 237–247. Faria, Á. (2008). TICteando no pré-escolar: contributos do blogue na emergência da literacia. Educação, Formação & Tecnologias, 1(1), 161–167. Fawcett, L. M., & Garton, A. F. (2005). The effect of peer collaboration on children’s problem-solving ability. British Journal of Educational Psychology, 75(2), 157–169. Figueiredo, M. P., Gonçalves, N. A. F., Ferreira, A. P., Henriques, A., & Semedo, M. (2007). Para além do tato, um projecto de ComTato: experiência de utilização de videoconferências em educação pré-escolar. In P. Pequito & A. Pinheiro (Eds. ), Quem aprende mais? Reflexões sobre educação de infância (pp. 249–256). Vila Nova de Gaia: Edições Gailivro e Escola Superior de Educação Paula Frassinetti. Folque, M. A. (2011). Educação Infantil, tecnologias e cultura. Pátio Educação Infantil, 9(28), 8–11. Folque, M. A. (2012). O aprender a aprender no pré-escolar. O modelo pedagógico do movimento da escola moderna. Lisboa: Fundação Calouste Gulbenkian. Gonçalves, S. (2006). Representação pictórica em papel e no Paint. Análise comparativa dos desenhos realizados por crianças de 5-6 anos (Dissertação de Mestrado em Educação, Área de Especialização em Tecnologia Educativa). Universidade do Minho, Braga. Howard, J., Miles, G. E., & Rees-Davies, L. (2012). Computer use within a play-based early years curriculum. International Journal of Early Years Education, 20(2), 175–189. Jenkins, H. (2006). Fans, bloggers, and gamers: exploring participatory culture. New York: New York University Press. Jonassen, D. H. (2006). Modeling with technology: mindtools for conceptual change. Columbus, OH: Merrill/Prentice-Hall. Levy, P. (1999). Cibercultura. São Paulo: Editora 34. Malaguzzi, L. (2001). The Hundred Languages of Children exhibit: the story of an educational adventure. Rechild: Reggio Children Newsletter, 5, 1–4. Ministério da Educação. (1997). Orientações curriculares para a educação pré-escolar. Lisboa: Ministério da Educação. OECD Directorate for Education. (2006). Starting strong II: early childhood and care. Paris: OECD. Oliveira-Formosinho, J. (Ed.). (2008). A escola vista pelas crianças. Porto: Porto Editora. Papert, S. (1996). The connected family: bridging the digital generation gap. Atlanta: Longstreet Press. Piecka, D., & Figueiredo, M. P. (2009). Creating meaningful connections with videoconferencing in Early Childhood Education: experiences in Portugal and the USA. In P. Dias & A. Osório (Eds. ), VI Conferência Internacional de TIC na Educação – Challenges 2009 (pp. 1085–1093). Braga: Centro de Competência da Universidade do Minho. Plowman, L., & McPake, J. (2013). Seven myths about young children and technology. Childhood Education, 89(1), 27–33. Portugal, G., & Laevers, F. (2010). Avaliação em Educação Pré-Escolar – Sistema de Acompanhamento das Crianças. Porto: Porto Editora. Reis, P., Linhares, E., Costa, F., Campos, J., Luis, H., Alves, M., & Figueiredo, M. P. (2008). Relatório de Avaliação do programa KidSmart. Santarém: DGIDC/ERTE e ESE Santarém. Sarmento, M. (2008). “Estudos da criança” como campo interdisciplinar de investigação e conhecimento. Interações, 10, 1–5. Siraj-Blatchford, I. (2010). A focus on pedagogy. Case studies of effective practice. In K. Sylva, E. Melhuish, P. Sammons, I. Siraj-Blatchford, & B. Taggart (Eds. ), Early childhood matters. Evidence from the Effective Pre-school and Primary education Project (pp. 149–165). Oxon: Routledge. Siraj-Blatchford, I., Sylva, K., Muttock, S., Gilden, R., & Bell, D. (2002). Researching effective pedagogy in the early years. Londres: Queen’s Printer. Soares, N. F. (2006). A investigação participativa no grupo social da infância. Currículo sem fronteiras, 6(1). Soundy, C. S. (2012). Searching for deeper meaning in children’s drawings. Childhood Education, 88(1), 45–51. Vygostky, L. S. (1978). Mind in society: the development of higher psychological processes. Cambridge, Massachusetts: Harvard University Press.